With great enthusiasm and encouragement of family, friends, associates and well-wishers, I want to express my sincere thanks to everyone for creating the time to participate in this historic event of our victory to contest the 2019 governorship election in Abia State on the platform of our chosen party, the African Action Congress (AAC). Since 1999, we the people of God's own state has been marginalized by the same people elected to serve us as our leaders, we have been backward in all areas because the leader's has nothing good for their people. The same group's of leader's has been moving from one political parties to another which makes it impossible for we to see any sign of hope in nearby future, considering the large numbers of death toll in our state since 1999 to date and because of the evil and wickedness our leaders push on into during 2016/2017 agitation of our poor masses and youths due to failure of leadership that has brought frustration to millions at the grassroots in our state which was one of the major reason to the agitation and protest for freedom and for those we elected to serve us to allow the continuously killings of the people for this agitation simple means they are not qualify to serve us as leaders as their silent, and the killings shows a total failure of their leadership in our state. This set of people are of the old era and we are in the 21st century and it is the era of the youth and this is why the Not too young to run bill was signed into law by the President, this bill now make it necessary for the young once to engage in to the grassroots politics in the nation so as to participate in the 2019 general election. As the national youth leader/Mandate I aspire to bring visionary leadership to the people of Abia State as am participating in the forth coming gubernatorial race in Abia state with the primary aim to invest in the youthful populace that have been neglected for too long in Abia state. Also to turn Abia State to a state where education will be a right for all and will be made mandatory for every child from primary to University rather than seen as a privilege for the privileged once. Moreso, I intend to transform Abia state into a state where citizens do their businesses without fear of intimidation or victimization, I intend to turn Abia State to a state where crime rates, breaking of law and order eradicated thereby providing health insurance care for the masses at the entire 184 wards in Abia state mandatory in embarking on the operation safe lives of the poor masses in the grassroots to eradicate the death toll in our land which will leave us to a state where peace, love and harmony will thrive. However, in line with this few objectives below I hereby present my vision, mission and goals for 2019 Abia State liberation agenda on operation youth take over leadership in Abia State. My Vision:- To liberate Abia State from the hand's of looters, oppressors, bad governance and God fatherism to enable the state and her citizens transformed to a part of holiness and peacefulness by eradicating poverty and hardship by using the grassroots manpower and the youths energetic capacities to develop the state to a standard mega city as capital of the Eastern Nigeria. My mission:- To make Abia state Foremost in the Eastern Nigeria, Nigeria at large and globally. By providing qualitative and reliable educational assignment, encouraging academic and moral excellence, Promoting sustainable human resource development and International co-operation which will create employment, empowerment and skills programs development to transform Abia state for the brighter future of our youths and poor masses at large. 2. Dual carriage ways for trucks,heavy duty vehicles and roads networking to open our state mostly Aba which is designed to serve the African nation as center for productivities. 3. International Airport to give access for people to come in easily to produce and export Good's and services. 4. Railway infrastructure which I believe is imperative in linking all the states that has boundary with our state which will alleviate and relief all Abians indigenes from untold hardship and stress in transportation of goods and services as Aba been the commercial center of the South Eastern Region and Abia state is located at the center of Eastern Nigeria as formal capital of Biafra Nation. The African Action Congress (AAC) has been established as a grassroots party of the workers, artisans, middle class professionals and all those who desire the progressive development of Nigeria. The manifesto of our party promises welfarist programmes and building the capacity of our economy so that we can provide jobs for the youths and make our country stable and secure. • These are the values that I believe in. • These are the values I am ready to defend. • These are the values I am determined to propagate. • These are the values that drive my present desire. If elected, I shall immediately embark on the full restoration of the glory of Abia State and make the poor masses of Abia State the cornerstone of my government revamp the environment that has become a cause of serious anxiety to Abians and relieve Abia of the persistent gridlocks that have made our lives brutish and nasty. Our government’s focal point shall be to provide the greatest good for the greatest number of the people of Abia State. I am inviting you today to join me in the journey to take Abia State to a new dimension by transforming the manifesto of our past leaders to the programme of action. I am sending a clarion call to our churches, market association's and organizations my party members, men and women, youth and the elderly, that there is a lot of work to be done to achieve the Liberation of Abia State of our dreams. 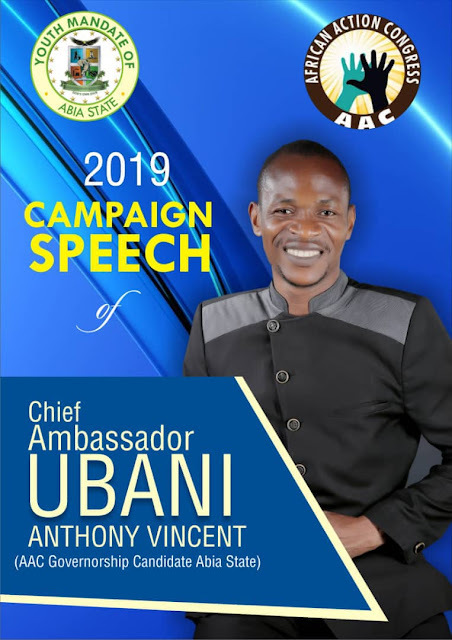 I present myself as a capable, competent and virgin hand to make Abia greater. I call on all citizens to join me to elevate our state in all facets of human endeavour through improvements, enlightenment and development. I urge you all to come out with your PVC at the appropriate time to vote for me at the 2019 Governorship election in Abia state so that we can start the journey towards peace and order for the development of the good people of our dear Abia State. History is not made in a day, but it is made on the day that you start to make the labours of the past and the hope for the future the touchstone of our endeavours. That day is today when you start working towards producing me as the next governor of Abia State. 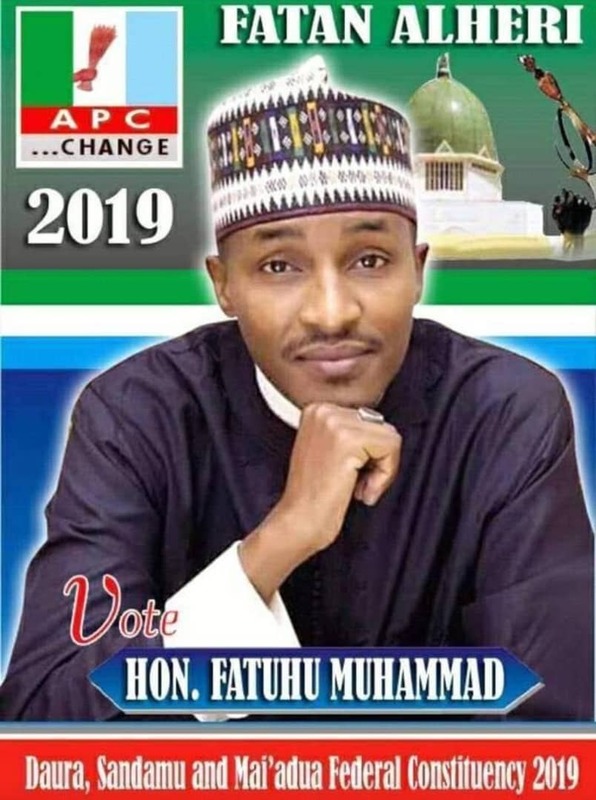 ACC may produce me as the governor with even without House of Assembly members to protect me from been impeached so my good work will decide if I will be impeach by the house or I will push the house to stand on the right part to discharge their duties as elected to serve. The choice is in the hands of the men of God I charge you all the leaders in the church to do the right thing because the future of this state and the poor masses is in our hands don't keep silent and watch your people continue to suffer and die in failure's of the leadership and at this point I see know one that can give the poor masses what they deserve unless the boy with clean hands and integrity and commitment who is not ready to negotiate or compromise this task I am that poor boy ready to fulfill this promise and deliver to you your wishes. I pray that God Almighty shall crown all our efforts with resounding success. Long Live All churches in Abia state.